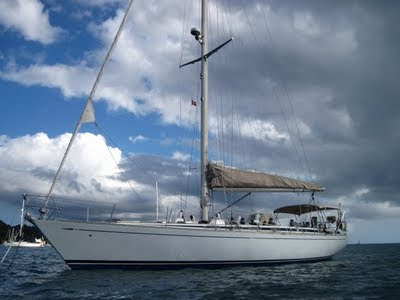 Adios is a German Frers Design Nautor Swan built in 1985 with a recent refit in 2011. This spacious Swan yacht is now available for charter in the Caribbean and is fully crewed with Captain David and Chef/Mate Sabrina. Charter this Swan Sailing Yacht and sample the joys of sailing one of the most famous Sailing Yachts with all their amenities. Experience the power of these ultimate sailing yachts - exhilarating and stimulating. David and Sabrina will look forward to sailing with you in the warm Caribbean waters, so just sit back on deck, relax and let the crew take the boat to whichever destination you choose. This will be the vacation experience of a lifetime. Adios also offers luxury pleasure charters with a bit of an edge. They like to specialize on round trips such as SXM to BVI. This offers a great sailing opportunity, fabulous sailing while in the BVI, and the option to either fly back inexpensively or make that longer return sail to SXM. Around SXM, Anguilla and St Barts is another option as well as any points further south. For those interested in learning to sail Adios runs offshore sail training charters with a credited instructor in early December and again in February. These trips usually involve sailing to Guadeloupe and St Vincent. Adios has three staterooms, each with a private head (one shared by the crew who are housed in the forepeak). The aft cabin has a full centreline queen, the others are amidships, port and starboard cabins with upper /lower berths. Four guests is most comfortable but six can be accommodated.